During the Return Of The Jedi 65 back releases, the image on this figure's card was replaced with a new image. 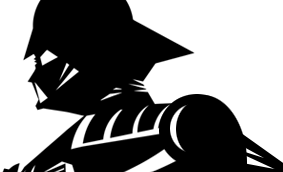 Though known examples indicate that the switch took place during the 65C production run, It is possible that earlier examples could exist. The original photo made its last appearance on the Return Of The Jedi 65C back. Note that the distinction of 65D and 65E cards is the Anakin figure offer stickers, the 65C was the last printed 65 back variation. The new image was used on all other cards after including The Power Of The Force and Tri-Logo cards. Comments: You may not know it by looking at the vintage Chewbacca, but this bad boy has ripped the arms off of many a figure in his twenty-five year reign of supremacy. Unlike the modern line, this figure was only available like this. Back in the day, collectors had to use their imaginations to set Old Chewie on a mynock hunt or have him track Probe Droids with his pal Han Solo on the icy plains of Hoth. 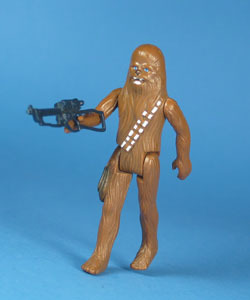 Major Variations: Though all vintage figures have minor variations, Chewbacca has no major variations. There is often talk of a green-limbed version of this figure, but it is popular belief that it is discoloring due to plastic deterioration. One of the minor variations that is interesting enough to note is the version with the iridescent green/brown pouch (picture below). There are only a few specimens documented, but that cannot, and should not, conclude the rarity of this variation. There is a variation in the color of Chewbacca's weapon that is near impossible to spot without holding it in front of light. The early version of this accessory was molded in dark green plastic. Later versions were molded in dark blue/gray plastic. The green version is commonly considered to have come only with the Early Bird Set figure, but it has never been proven to be exclusive to the set.